Neil Peterson (previously known as ‘Nearly’ due to missing out winning on many countbacks! 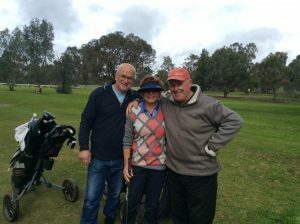 ), led the ‘Dirty Dozen’ players in to the 19th recording an excellent +2 in Saturday’s par event. The course continues to play well despite the recent rains. Russ Wealands continued a return to form as did Jonathon Fisher both coming in with -1, but Russ was declared Runner Up after the countback. Four ladies played a Stableford Round with Jan Wealands with 32 Points leading the pack.